Al Ain are holding on for dear life to Sharjah’s coat tails in a desperate bid to maintain a grip on their Arabian Gulf League title – earning a hard-fought 2-1 win at home over promoted Fujairah. The hosts were in control throughout at the Hazza bin Zayed Stadium but a terrific Ibrahim Khameis effort – his shot arrowing low into Khalid Essa’s bottom right corner – 13 minutes from time made things interesting. Before that, the Boss opened the scoring 14 minutes in when a half cleared Bandar Al Ahbabi cross fell to Japanese utility man Tsukasa Shiotani and his well-struck volley took a deflection on its way in. Both sides had chances and the reigning champions seemingly had a second before the break when Jamal Maroof sidefooted home Marcus Berg’s cushioned header, but the Video Assistant Referee (VAR) came into play and the goal was ruled out with the forward deemed offside. The Garden City side did get a second goal though after the interval when Ruben Ribeiro collected Saeed Mosabah’s centre and calmly dummied a defender before firing in to make it 2-0. Khameis clawed the Wolves back into it, but Al Ain held on and will feel they should have won by a more handsome scoreline. Bar Shiotani’s fine – if slightly fortunate opener – Al Ain had struggled to turn their dominance into an advantage. After a quiet first half, Caio exploded into life in the second as the Boss looked to bank the three points. 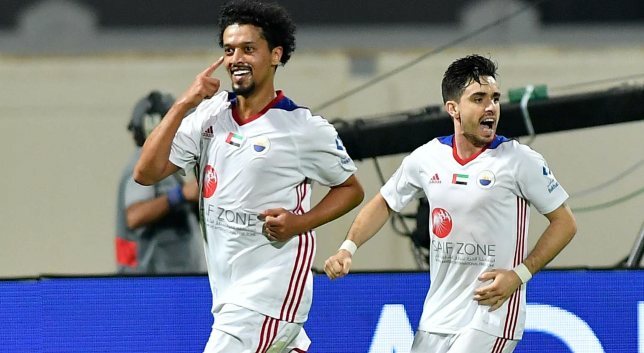 Fujairah had their moments but always looked susceptible on the counter-attack, particularly when the ball was at Caio’s feet, and he will be disappointed not to leave his mark on the game with a goal or assist. He was always the first player team-mates looked for in the opposing half as he hugged the touchline or hung on the shoulder of the last defender. Ultimately he did play an aesthetic role in the crucial second goal, holding up play and impishly flicking a pass into the path of the onrushing Mosabah whose cross found its way to Ribeiro who finished with aplomb. As good as Caio was – and he was excellent – you can’t help but feel that a scoreline that ultimately proved a little too close to call for the home side could have been made far more comfortable by a more clinical performance from the Brazilian. 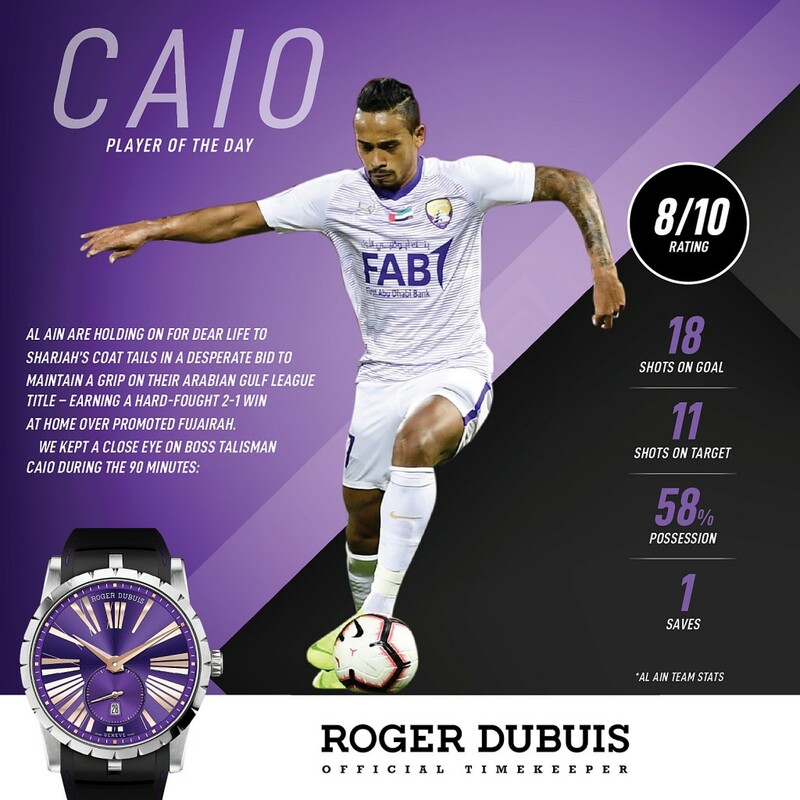 He was always the main outlet for Al Ain – who were forced to soak up periods of pressure from the marauding visitors – as his pace and trickery posed constant problems. But his brilliant nutmeg in the opening minute of the second half led to a hasty shot that screeched just wide, while as the Wolves employed more reckless tactics late on as they sniffed an equaliser, Caio allowed goalkeeper Abdualla Al Tamim to dispossess him with two team-mates in white screaming for a pass in the centre. Khalfan Mubarak pulls a goal back to make it 2-1. Al Jazira head coach Damien Hertog felt his side deserved more after their defeat to league leaders Sharjah on Friday night. Hertog’s side were beaten 3-2 in a close encounter at Sharjah Stadium – a damaging defeat in terms of their chances of Arabian Gulf League title glory. They went into the game in third place and nine points adrift of the King, with hopes of cutting down the gap to six with a win. But Sharjah instead opened up the gap to 12, while Shabab Al Ahli Dubai’s 3-1 win over Ittihad Kalba saw them jump into second and dump Jazira down to fourth. Jazira conceded all three goals in the first half, with two coming from the penalty spot courtesy of Igor Coronado as Sharjah went 2-0 up in the first 10 minutes. 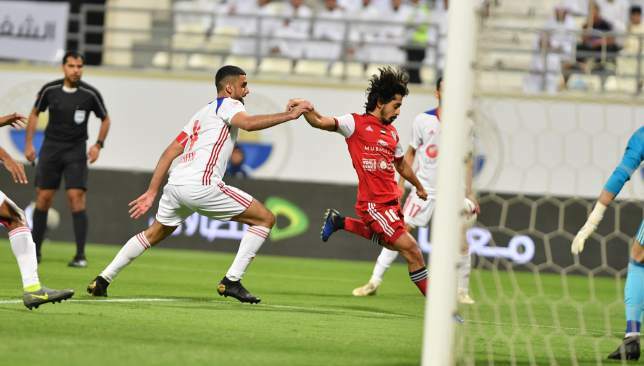 Khalfan Mubarak reduced the deficit for Jazira but they found themselves further behind after Sharjah took advantage of Nacer Barazite’s slip to strike again through former Al Wahda man Mohamed Al Shehhi. Fares Juma added a second after half-time for the Pride of Abu Dhabi but despite controlling the game, Hertog’s side could not add to their tally. He added: “We dominated the game with possession and kept Sharjah’s attackers, who are very skilful, relatively quiet. We knew we had to be at the top of our game against Sharjah and we were as a team as I cannot fault the efforts of the team performance. Hertog also defended Ali Mabkhout’s performance, saying it’s unfair to expect the club’s top-scorer to find the back of the net every week. “Ali Mabkhout always creates a lot of chances but that didn’t happen today,” added the Dutchman. Jazira will be back in action on Wednesday, April 4, when they host Al Ain in an Abu Dhabi derby and a game that will likely extinguish any title hopes for the losing team.